A new setter this week, but a game which, according to Wiki, dates back to World War I. In twenty-eight clues, we had wordplay plus a letter. I was a bit perplexed by the “in five separate groups” phrase, but felt sure all would become clear at the end. I started on the acrosses, but after ten clues with not a single entry, I decided to try the downs. 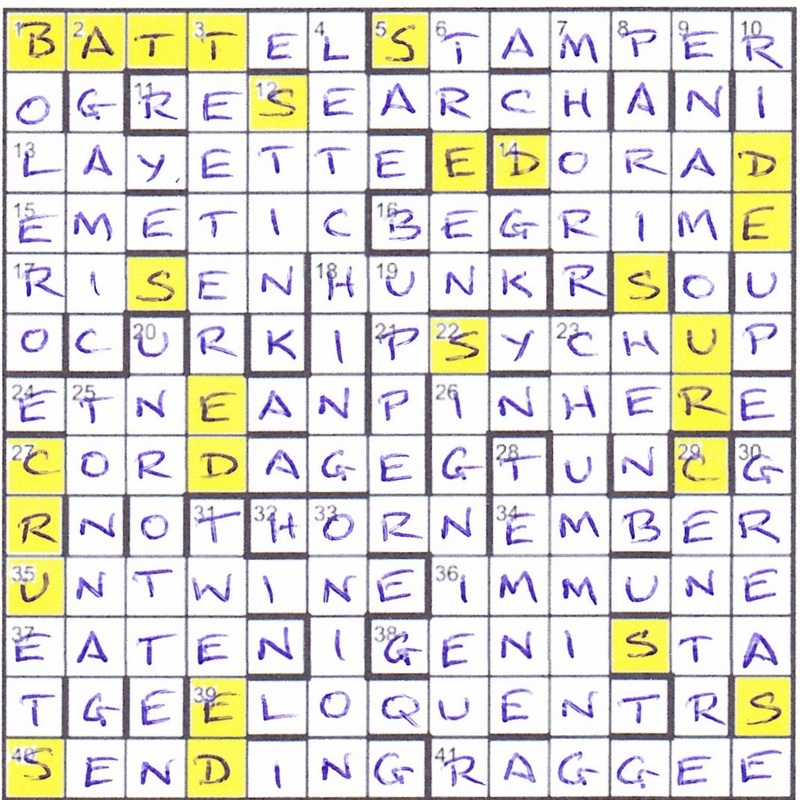 However, that was not before realising that every clue had a nautical reading, and I can’t even guess how tricky that must have been… especially for a debut puzzle. 1dn Steel hull of Lance is at centre of furore (6) came to my rescue with TOLEDO followed soon after by 3dn In staying away from the drink, rear admiral had wavered (8) for TEETERED. I’m sure I wouldn’t have got that so quickly if TEETEE (for teetotaller) hadn’t appeared in another puzzle recently. So, back to the acrosses, and with 1 TOOTER, 13 LAYETTE, 15 EMETIC and 17 DIVER, I finished the north-west corner much more quickly than I thought I would. RESEARCH enabled me to get going with the north-east corner, and it was only by solving 19dn It provides a boost to torpedo, about to be fired (5) as U-BOAT that I was delayed in getting PSYCH-UP at 21ac; 19 turned out to be UPPER ([S]CUPPER – C). After that, the bottom of the grid filled out nicely, although it wasn’t a quick solve, not helped by 27dn WHILOM being a new word for me. In the end, the grid took just short of three hours. My vote for favourite surface reading goes to 32ac One could be honking either side of Hawke with onset of nausea (4) for HORN (H OR [E] + N(ausea), extra letter [E]). The clue which made me smile was 40ac Recuperating man disheartened by what grog and womanising do (7) for MENDING (M(a)[N] + END IN G, extra letter [N]). And so to the endgame. The five groups were just 5 or 6 letters separated by one or more spaces. In sequence, they were TEURSC, TCRENE, TEREN, TATLEB, NSREI. These had to be unjumbled to give real words and then fitted into the grid to make new words. The first looked likely to be CRUETS (it’s only as I write this that TRUCES becomes a possibility), but the second could be CENTRE (or CENTER), RECENT or TENREC. The third was ENTER, the fourth BATTLE and the last RINSE, RISEN or SIREN. A few choices needed to be resolved and it seemed like it was just a case of trial and error. In the end, it didn’t take too long to figure it all out, perhaps 30 minutes. Of course, BATTLE ended up being BATTEL at 1ac, and ENTER was TREEN at 6dn, despite Paddock’s devious CRUES which looked like it would hold one of the cruisers. Thanks, Paddock, for an excellent divertissement in the run up to Christmas, and congratulations on the nautical clues. This entry was posted on 6 January 2017 at 4:00 pm	and is filed under Solving Blogs. Tagged: Battleships, Paddock. You can follow any responses to this entry through the RSS 2.0 feed. You can leave a response, or trackback from your own site.